On a hot South Carolina day there is nothing better than stepping into your cool, comfortable and welcoming home. 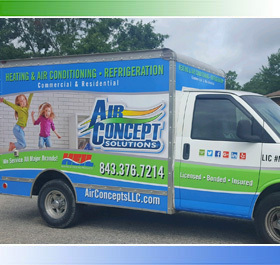 For over 30+ years, Air Concept Solutions, LLC has been keeping Summerville, Goose Creek and the Greater Charleston area residents comfortable with affordable, quality air conditioning services. We have earned the trust of our customers with years of quality service and integrity and we promise you our best – the best AC service, the best AC advice, and always our dedicated time to make sure you get the best possible air conditioning solution. Our NATE certified technicians are experts in AC system design, installation and maintenance. We are a fully licensed and insured, full service AC repair company. We will do our best to return your phone call in a couple of hours or less. We provide free estimates to our customers to help you in your decision making process. If required we can perform a load calculation and be able to explain additions or changes to your ductwork that may be needed. When we arrive at your home or business Air Concept Solutions AC Contractors display their license number on their company’s trucks, business cards, and advertisements; this gives you the peace of mind that the contractor knows what he or she is doing. If you don’t see a license number, ask for one. Performing preventative and annual maintenance for your equipment gives you optimum performance and is another one of our many services we provide. We also will help you find out if your ac equipment is still under warranty according to the manufacturer’s terms and conditions. Our customers are very important to us and “Doing the Right Thing” is our company mission. We want to build a good working relationship with you, our customers, and ensure that you are happy with the ac service that we provide. We are concerned about your comfort and can advise you on minor air conditioning maintenance and troubleshooting issues. We will also train you on how to operate your Heating & Cooling system so that you can have a better understanding and learn ways to save money. When summers get hot, it’s important to know that you can count on your air conditioner to keep you home or business comfortable and cool. Customers who proactively schedule regular AC maintenance with Air Concept Solutions get priority attention and we make sure you are set and cool during those hot summer days. There are several warning signs that can help you recognize AC problems early before a complete breakdown of your AC system. Try to be aware of the signs so you can head off potential problems. If your AC does stop working unexpectedly, give us a call and we will schedule you ASAP to have a look. Your air conditioning is not cold enough. You air conditioning does no longer seems to cool your home evenly. Some rooms are or floors may feel much warmer than others. You notice cracks or leaking in the AC unit itself or the ductwork connections. The air doesn’t smell right. If you notice there is an odor when your AC is running or the air just does not smell as fresh, it may be time to have it looked at. When your AC system gets to be unreliable or finally breathes it’s last, we can get you help quick. Give us a call and we will send a certified technician over to FIRST check to make sure your air conditioner really need a replacement, and THEN give you advice on the best cost saving system for your money. Today’s AC systems are so much more efficient that you should notice a reduction in your summer energy bills once you have your new unit in place. We install all types of AC units from packaged to ductless to split units. How old is your system? Many people start to see poorer performance on systems that are 10 years and older. Check your monthly energy bills. Are they getting increasingly higher? It may be time to evaluate your AC system. Is your system not cooling your home consistently throughout? It may be time to consider a replacement. Most important! We will not sell you a new AC system if you don’t need it. Call us and we will give you a straight answer. If we can fix it for a reasonable price we will. If we see your current system is either too far gone or is going to continue costing you extra money with fixes, we will let you know that too. We are more interested in having long-term customers than making a sale so be assured that we always have your best interests in mind because we want you to be our customer for years to come. Please call us today for your next call us for your next AC repair or maintenance service. Air Concept Solutions provides reliable and affordable HVAC and AC repair services to the local Summerville, Goose Creek and greater Charleston, SC area. We have been in business for over 35 years. Give us a call and we’ll get your AC system up and running quickly.